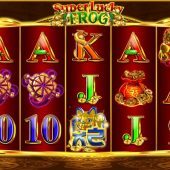 Super Lucky Frog slot is a 10 line game not to be confused with the Netent game of the same name! The theme is Oriental with appropriate characters such as the bag of tokens, golden Frog, gold idols and lucky dishes. There are 10 lines over the 5 reels and 3 rows grid and all tiles are single. The game is naturally overlaid with the typical Chinese pipe and cymbals soundtrack we've heard many times before. The lower awards are made up of card symbols. The pays are quite good for the 5-of-a-kind wins with 5x stake for all the card symbols up to a sizeable 50x stake for the pair of Gold Idols. You have Wilds on all reels which need a special mention, not only because 5-of-a-kind pay a huge 1000x stake but the fact that when one or more appear in a winning combination they are assigned a multiplier of 2 to 10x. They aren't cumulative, for example if 2 appear in a 3 symbol win they are both assigned the same value and only one counts. This means the Gold Idols can pay up to 500x but the multiplier doesn't work on the Wilds - only 1000x stake win. 3 or more Golden Cat scatters anywhere in view triggers a free spins feature. You pick a token for a quantity 5 to 20 then the spins are played on the same reels as the base game, with no enhancements at all. You can retrigger them getting the same quantity as you originally started with. The real bonus comes at the conclusion of them, when you pick another tile which reveals a multiplier, like with the Wilds, of 2 to 10x which is applied to the total won in the bonus round.